Parrot is an independent fashion agency based in Amsterdam, representing designers from Europe and the US. Parrot represents designers of woman’s clothing with a modest feminine feel alongside a confident attitude. With a preference for sophistication, conscious materials and a laid back feel, every designer has their own point of difference. We work with a small team trying to build direct and personal relationships with both designers and retailers. We are operating within the advanced contemporary and designer segment. With showrooms in London, Paris, Antwerp and Amsterdam, Parrot has a steady partnership with online players, department stores and multi brand boutiques. Together we are trying to build a qualitative and sustainable distribution for both supplier and retailer. Originally founded in 2005, Goldsign was re-launched and envisioned in 2016 under Creative Director Karen Phelps. Since its inception, Goldsign has represented the highest expression of denim in fashion. Today the collection continues to push and define this idea, however now incorporating a contemporary take with inspiration and consideration of modern design, thoughtful detailing and 90’s minimalism. Karen Phelps says she's always been drawn to the authenticity and classic functionality of American style. Goldsign is represented by Parrot Agency in Benelux. For inquiries please contact noor@parrotagency.com. 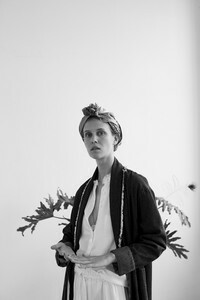 Launching her ready-to-wear and footwear collection in Spring 2013, Maryam Nassir Zadeh draws inspiration from her international perspective as an Iranian born, American raised woman. Encapsulating an elegant take on laid-back dressing. Described as “classic but not conservative”, her label has a distinct feel for vintage references in current designs. Originally from Iran, Maryam Nassir Zadeh grew up in Los Angeles, then moved to New York to receive an associate’s degree in Fashion Studies at Parsons. Maryam Nassir Zadeh is represented by Parrot Agency in Benelux. For inquiries please contact noor@parrotagency.com. Ulla Johnson, daughter of archaeologists, honed her signature style between the streets of New York and the far-flung destinations of their family travels. She has never wavered on her steadfast attention to the details of construction that have become her hallmark, basing each of her collections on a foundation of natural fibers, beautiful finishing, and ease of fit and form. The Ulla Johnson label has become synonymous with custom prints, intricate embroideries, and fine tailoring. Ulla Johnson is represented by Parrot Agency in collaboration with Findings Showroom in the Benelux. For inquiries please contact lauren@parrotagency.com. New York-based R13 is adored for its shredded skinny jeans, leather jackets and perfectly cut jersey basics. The label’s rock-'n'-roll aesthetic is inspired by the iconic Gadsden flag which boasted the motto' "Don't Tread On Me" - a statement reflective of the brand's rebellious attitude. With clear references to the London punk and Seattle grunge scenes, the collections continue to tap into the effortless, tomboy persona of the R13 girl. It is a juxtaposition of both look and feel, where smartly tailored pieces live alongside delicate mohair sweaters, oversized coats, repurposed denim jackets, and concert tees. Innovation in denim remains a cornerstone of the brand. R13 is represented by Parrot Agency in Benelux. For inquiries please contact noor@parrotagency.com. Raquel Allegra’s formative years encouraged a creative process of instinct, experiment and play. Raquel’s design career grew naturally with the origination of a shredding technique synonymous with the namesake label. Full length webbed cocoon shapes evolved out of laborious experiments with oversized vintage t’s recycled from the Los Angeles County Prison System, and informed a new informal beauty within the industry. 2009 marked a maturation for the brand as the collection expanded to include richly textured pieces in deerskin, linen, cashmere, and French lace. Raquel Allegra is represented by Parrot Agency in Benelux. For inquiries please contact noor@parrotagency.com. Designer and founder Dierdre Roffoni created Xírena based on her years of travel to the island of Formentera, Spain. Starting with lingerie and swimwear, inspired by the carefree, bohemian environment, the collection evolved into easy ready to wear pieces. Soft shirting, gauze dresses and jersey, Xírena is all about easy pieces that embody the LA lifestyle. Xírena is represented by Parrot Agency in Benelux. For inquiries please contact noor@parrotagency.com. Inspired by vintage American military gear, MMI was founded in Italy in 2007. All products are made in Italy. With it’s sophisticated coloring and detailed finishing techniques, the MMI Parka is now the icon in its category. Starting from the exemplary Parka, MMI has evolved into designing bombers, trenches and a full line of accessories. Mr & Mrs Italy identifies utility garments with a strong tradition and a rich history. Items are transformed in unique, fashionable pieces using handcrafted materials, often exclusively developed for the brand. Mr & Mrs Italy is represented by Parrot Agency in the UK and Benelux. For inquiries please contact noor@parrotagency.com.